I’m writing myself in circles with the chapter I’m working on, and it occurred to me that some feedback from actual rather than virtual people would be incredibly useful. I have two questions that I’d love to have answered. What are your concerns regarding your kids and writing? 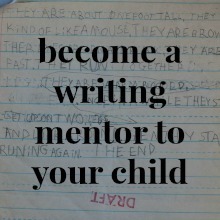 What goals hopes do you have for your kids as writers? (Edited to add: after reading your comments, it seems that many parents once had concerns about their kids’ writing, but have let them go. Hooray! If you want to mention what your former concerns were, that would be helpful to me too. I think that parents of younger kids often have more concerns, as they haven’t yet been able to watch their kids evolve as writers. If you don’t have children (or even if you do), feel free to answer the same questions about yourself. Quick responses of a few words are fine, as are wordy rambles. Any feedback will help. Thank you. With a cherry on top. How could we resist that photo? I’m probably an oddball. At this point (and this was not always the case), I’m grateful that one has turned out to be an amazing writer, and hopeful that the other will eventually feel comfortable expressing himself in written form. He has many other strengths as a person, he doesn’t need to be A Great Writer, although it wouldn’t surprise me if he pulled that out of his hat, too. Digression (but I’ll bring it back around): my dad made a very good living writing; he was a TV journalist (back in the days when they had some credibility and respect). But it turned out – when he retired and wrote a book – that long form prose wasn’t really his strength. It wasn’t a bad book, but it didn’t read as well as his on-air stories always had. His strength was taking other people’s ideas and points of view and turning them into stories that people wanted to hear. A *powerful* talent. But one that could have easily been overlooked by an 8th grade English teacher. Ooh, I love the digression. It speaks to the notion that there are so many different forms that the written word can take. (And one of my goals for this book is to help parents find forms that are intrinsically interesting for their particular, quirky, unique kids.) Going back to the Daniel Pink book that I mentioned a few posts back, A Whole New Mind, I think Pink would say that your dad was especially good at two of the qualities he writes about. First, he was good at symphony–an ability to bring disparate parts together–and story, which is an ability to take information and build a compelling story from it. Kids who have parents who value their natural talents–like you have with your kids–are so lucky! ur adorable. there. that’s one of my concerns. lazy spellers! no, not really. i’m actually quite impressed how well my daughter has adapted to spelling shortcuts. and as far as spelling goes, i overheard avery telling her dad last night that she loves to look up words in the dictionary. i had no idea, and we spend all day every day together! i read this post, then went for a walk to pick up my kids from the neighbors, so i had some time to think. it was then that i realized *i really don’t have any actual concerns about my children and writing! * wow! what a relief! i truly believe that you’ve helped me shed many of my unreal concerns by helping me see outside the traditional school view of children and writing. when avery went back to school last year (briefly), she didn’t have the best handwriting in the class. the teacher actually discussed her lowercase s’s at our parent teacher conference. they looked more like capital s’s. i thought, really? is this really your concern with my daughter as your student? now, a year later, i have to say that her handwriting is really beautiful. and it is not because she has spent hours practicing. in fact, i completely backed off when it came to her writing and let her write when and what she wanted. from what i’ve observed, she hasn’t really written much in the last year, but her writing has improved tremendously. she now takes pride in her handwriting. as for content, my hope is that my children learn a way to express themselves through writing, but that is only because i’ve benefited so much from writing. they might find a completely different way to express themselves. i just want them to have the tools to be able to write if they so choose. and more and more i’m thinking that these tools will just come naturally over time. maybe not at the same time as some of their schooled friends, but when they are personally ready to develop such skills. And oh, that teacher! I remember in junior high we had spelling tests, and if we didn’t form the letters correctly, we got the word marked wrong, even if we’d spelled it correctly! I’m a very visual learner, and spelling has always come naturally for me, but I constantly got dinged for my “creative handwriting”. See my handwriting in the header? I let it get more and more creative, out of spite for my teacher’s constraints. I hate it when stuff like that gets categorized as writing. Your hopes for your kids are just lovely. And completely doable too, I would think! My hopes/goals for my kids are that they learn to compose coherent emails, to use writing as a medium for their ideas, stories, and inspirations, and to write a decent essay. My firstborn, who just turned 11, is taking a class this spring on creating graphic novels. She immediately realized that she wouldn’t have me available for word spelling. She now keeps a spelling notebook, filling it with words she may need. I want my kids to be internally motivated, as she is in this case. I want them to become efficient writers and if they become great writers that is fine too:) I am sometimes concerned that the internal motivation won’t always be there. I loved hearing about your oldest and her spelling notebook. I think too often we get hung up on the mechanics of writing–spelling, grammar, penmanship. Instead, if we can help our kids find writing that they want to do–like your daughter has with her graphic novel class–they’re likely to see those mechanics simply as tools that can help them say what they want to say. They’ll learn how to work with them because they’re useful. Internal motivation is the most essential part of learning to write, I think. That’s what I’m hoping to help kids and parents with, with this book. Fingers crossed! Okay Patricia, I’m not sure I’ll be any inspiration but honestly…how could I not answer with a photo like that! As I mentioned before, my son is gifted with an LD and was only recently identified. Although he is extremely intelligent he has difficulty expressing himself on paper. One of his teachers used to say he was going to be a great precis writer some day. I’ll pretend I don’t know what I know now and tell you what I worried about: spelling, his inability to express his ideas on paper and the palpable frustration associated with that. I also have a five year old daughter that is reading chapter books. She wants to express her self on paper but hates the effort of having to figure out how to spell everything. She tries sometimes and other times I help by allowing her to dictate. Trying to figure out spelling can obstruct the thought process. A 4 year old’s mother: My son can’t even write his name. He can’t identify any letters. He has no fine motor skills. A mother of 4 year old twins: My kids can’t read let alone write! Many parents have expressed a concern about being unable to get their children excited about reading anything. The kids are not interested in the written word at all. They won’t sit still to be read to. Parents tell me they cannot find anything to read that the child has interest in. (In many cases I fear these kids have had too little parental involvement and TOO much media but that’s just my opinion). For me personally I think an interest in writing begins with an interest in the telling of stories. But I ramble. Let me know if you want me to pick up on any of these threads! Thanks for rambling, Just Peaches! It’s helpful to hear what your past concerns were, and the concerns you hear from other parents too. And I’m so glad that you take dictation from your 5-year-old when she wants it! I agree with you that (for some kids at least) storytelling can be a way into writing. That’s one reason I’m a big believer in taking dictation: young kids are often natural storytellers, but they’re years away from having the transcription skills necessary to get those lively, original thoughts down on paper. If we can help them get those thoughts to the page while they’re still young and in that telling mode, I think it can be a natural transition to the written word. The kids can get a sense of why writing has value when they have a copy of their thoughts to share with others. And yes, wanting to write is so tied to a love of books–whether you’re reading them yourself, or someone else is reading them to you. Love of books, yes, but also love of stories. I tell stories all the time: about my grandparents, about when I was young, about when they were young and sometimes we just make stories up. Someone starts and we all continue until we’re in heaps of laughter. My 15 year old makes up the wildest stories for my 5 year old until she’s almost leaping out of her bed! “Please, please tell me another story about Richard the pig” she pleads. You’re so right. Storytelling can be just as important as book reading. Kids who have parents who tell stories are so lucky! The picture plus the cherry on top? I’m a sucker for the cherry on top. My concern about my children and writing… well, the 11 y.o. doesn’t write at all. I find this troubling on a bad day. I worry that since he doesn’t write now he will never write, ever. Writing has always been central to me in my life: to keep myself company, to express myself to myself and to other people, I have always loved to put pen to paper and now fingers to keyboard. (Fingers to keyboard has so much less ring to it than pen to paper, eh?) So, since it means so much to me, sometimes I worry that he won’t find joy in it like I have. But… he might wish that I had better social skills and this is something he has in spades. So long as we can express ourselves SOMEHOW maybe that’s what counts? And what are my goals for my kids as writers. I mulled this over for a few minutes here and what comes up is this: I don’t think it’s for me to have goals for them. As writers or as anything else — they have and will have their own goals and what I want — well, I can only have goals for myself on my own behalf I think… (insert part about how I know this isn’t for everyone and this is just what works for my family in this moment, etc. etc. and other unschooler-type stuff). Your thoughts are absolutely helpful, and yes, you can keep the cherry. But can you tie a knot in the stem with your tongue? First, thanks for the great link to the Playing to Learn Op-Ed piece. First – I worry that if my kids avoid writing like the plague ( which they do) they will miss other opportunities to learn because the fact that the other opportunity has a writing component will be a total turn-off to them. Second- I worry that they will never be able to have the experience of discovering what they really think/want to say about something by hanging out with their own writing until the find clarity. Originally my goal for writing was that they by the time they graduate from my homeschool they should be able to write a grant! I figured my quirky gifted Nathan would need that skill. However, I hear that you can hire people to write grants for you. So now, my goal is for him to have the comfort and skills to be able to go to college. He has a real affinity for the natural sciences, so I don’t see him needing to be able to do a serious literary analysis, or write imaginative fiction. I do think he would benefit from being able to write a compelling essay or an organized thesis. Your second concern, “that they will never be able to have the experience of discovering what they really think/want to say about something by hanging out with their own writing until the find clarity” is, in part, the premise of Zinsser’s book. In writing about a subject, we learn about it. But what I think you’d especially like is that (from the front flap): “his purpose is to take the fear out of writing for science-minded people, and the fear out of science for humanities-minded people.” He has whole chapters filled with examples of fine science writing–by scientists, not writers. He thinks that anyone can write well if they can think well, and that’s what he sets out to prove in his book. I’m betting it might be useful to you and your science-loving boy. I worry that my kids get too little practice at home. If they were in school they would be writing every day. They would get comfortable with the idea and the practice of writing. I worry that without this they will to continue to view writing as hard and something they don’t want to do and fail to develop their writing skills even though they would be good writers if they wrote more. I view reading as the most critical skill for would-be writers, but actually writing is necessary, too. I was always considered a good writer in school. I found it easy to write fiction (though I almost never finished anything) but I found writing papers difficult. Hard to get started. All through college I viewed writing a paper as an arduous task that must be put off until the all-nighter the day before it is due. Somewhere in grad school I had finally written enough papers that I got the process and it became not difficult to sketch out ideas, research, think, flesh out ideas, write and edit a paper in a timely way. I would like my kids to enter college with this ability, but we are so very far from it. Evelyn will write loads of unfinished fictionlike her mother and strenuously resists writing non-fiction. Clementine will actually hide under a pillow, moan and wail, and snap off the pencil tip to avoid writing, say, a list of 10 words. 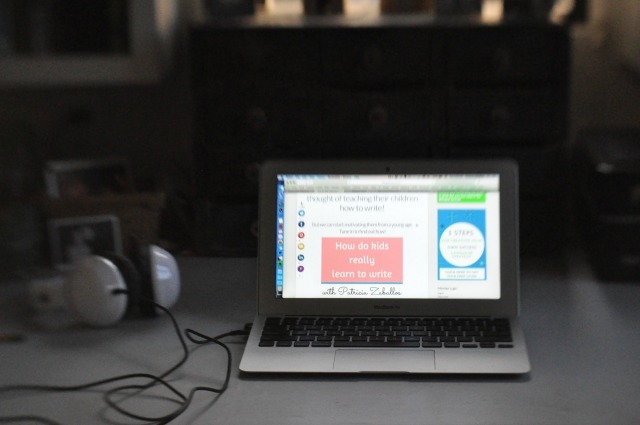 Writing regularly can be challenging for homeschoolers. You’re right: kids in school write a lot, because they have to. I’ve done workshops for years for all ages, and I’ve loved every minute of them. If it sounds like an idea worth exploring, let’s chat! 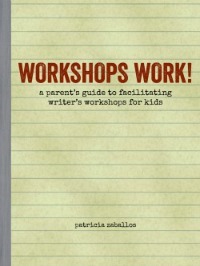 I’d love to chat about writer’s workshops. Hoping to make park day this week. Just wanted to say I have thoroughly enjoyed your waldorf guilt posts- spot on with all that, and I’m glad I’m not the only one. My kids are still very young, 3, 1, and not-yet-born, but I lay awake at night hoping they will have the opportunity to feel excited about holding a completely new and blank journal in their hands. I hope they get itchy about writing things down that enter their minds, and that they run with their imaginations, on paper. Technology has become such a large part of our society…I worry my kids will be typing on computers or iphones or whatever, instead of in black-and-white covered Composition notebooks. I worry they won’t feel inspired to make their own journals, with cardboard covers and a stick for the binding. I worry that they won’t feel inspired to actually WRITE at all, which is the true beauty of writing really, isn’t it? Yes, the computer offers such an easy outlet to “jot things down” quite quickly. But there is nothing like a new pack of pens and a book of blank paper sheathed in leather. I guess only time will tell. Thanks for taking the time to say hello, Jessica! I’m a fellow lover of journals and hand-bound books and paper and fancy pens and all that good stuff. The thought that they might slowly become obsolete breaks my heart. Still, my very technological kids–even the two teenagers–do their share of sketching and writing in journals and on paper. So there’s hope. Now on to my concerns: with my 7-year-old son, it concerns me that he only knows how to write very basic words, like “toot” and “cat,” and he rarely even writes those. I ask him if he’d like me to take dictation on a story about, say, his Legos characters and the scenes he creates about them. “We could make a comic book, like Tintin, about Legos!” I volunteer. No interest. Zilch. Possibly I am getting a little too much in his business, I guess. It’s MY idea, not his. When I see other kids his age and younger avidly writing sentences and even whole letters and stories, it is hard not to feel that he is so hopelessly “behind” he might have a hard time getting his writing skills up to par when he needs them. It gives me a real sinking feeling, and I also feel sad because I am just so interested in what he has to say and would love to help him express himself through writing. I also worry that he isn’t trying it because he is afraid of failure and frustration, and I’m not sure how to make writing feel worth the risks involved. Like others who commented, I find it hard right now to come up with real-life opportunities that inspire writing for my 7-year-old. My hopes? I hope that my children can have the courage to go ahead and plunge in and try to get their ideas on paper or on a computer screen even if they’re not perfect. I hope that they’ll learn to just see mistakes and rewriting as part of the process of discovery, kind of the way making a mess is part of planting a garden or cooking. I hope they’ll get that wonderful charge that comes when writing helps you discover something you didn’t know you knew or helps you understand something in a new way. I hope that they will feel they have the skills to tackle whatever writing projects come up in their lives and be able to communicate effectively. Thanks for the opportunity to share. Now write that book! I need it! It can be so hard to see other kids, especially school kids, writing away when your own child isn’t interested. I felt that way about my youngest for a long time–and still do sometimes. And my kids are like yours–they have radars that sense All My Eager Ideas and immediately shut down all systems! That’s when I know I need to back off. I don’t know if you saw my response to Dawn in my last post. Might be helpful, especially because your son knows you’re a writer. Another thought, which you may have tried, is to try taking dictation from your daughter instead. She’s younger, and might take to it quite naturally. She might want to dictate a story, or tell you about something she’s interested in. If that works out, see if she can share what she’s dictated with someone else–her dad, a grandparent, a friend. Some kids really get a kick out of sharing their work. If that happens for her, it might inspire your son. And he might worry less about failure, if he sees how a younger kid can do it. Then again, I don’t think you need to worry about your son being “behind”. I think one of the most important parts of developing as a writer is growing up in a literate environment. You can learn so much about techniques of good writing simply by being exposed to good literature, talking about what you like and dislike in what you read, etc. Even if kids get to the mechanics of writing later than other kids, if they have a sense of what good writing is, they’re likely to “catch up” pretty fast. Same thing goes for later readers, or kids who do formal math later. And like I suggested to Susan, you might want to consider forming a writer’s workshop at some point. When I’ve done this with younger kids, they often shared work they dictated, and sometimes parents even read the work aloud for them. Still, it was highly motivating for them. Your son might not be ready for something like this yet, but maybe in time. Lovely hopes. They’ll get there! I also need your book! Goals for the kids: Good spelling; legible handwriting (in my country we’re only taught long-hand, I think that’s how you call it, so most kids have different handwriting styles but as long as they’re legible they’re ok); coherent, compelling, concise and creative in their writing (fiction or non-fiction). Hopes for the kids: That they feel at ease and happy while writing. No matter what they choose to become, I want them to know how to express their ideas in a clear written form and to yield pleasure from that kind of communication. As of now I have no idea what they’ll become – the eldest says he wants to be an archeologist, has very good visual/spacial thinking, likes to draw and create cartoon stories – with very few words, preferably, 😉 – likes history and the natural sciences in general, the great outdoors, you get the picture. He learned to read at 5 but only started reading for pleasure at 8 – Harry Potter, only. He’s about to finish volume 7. Apart from HP he reads through children encyclopedias kind of books, and a handful of cartoon stories (sp. Calvin&Hobbes). He is very creative writing fiction in school – but only if it is a theme of his choosing. On given themes he just doesn’t get motivated and writes lame, quick stories you know he doesn’t care about. His spelling is terrible, his handwriting is now legible. My younger boy is showing a lot of interest in numbers, doing mental additions and subtractions, likes to draw and is very physical (he learned to ride a bike – without training wheels – at 3 1/2, for example). He was the later talker and is not very interested in storytelling (alas! it is true). Still, he loves to chat and has a very good vocabulary now, so I’m not worried or anything. He says he wants to be Bob the Builder and a fisherman. Personally I’m not very sure how to motivate/encourage my kids more. Their school doesn’t believe in homework (neither do I 😉 ) so the only writing the older boy does is in school, apart from his monster/planet games and various cartoon stories with little actual text. The girl is very keen on starting but has a hard time finishing her stories – how can I help her? Like I said, I really need your book! Marta, I think it’s fantastic that you don’t assume that the kids’ school will fulfill all of their writing needs. It’s great that you want to help as well. It seems that there are lots of good things happening with your kids and writing. Of your older son, you write “He is very creative writing fiction in school – but only if it is a theme of his choosing.” Me too! I’ve always despised assigned topics. I’m glad he’s getting to work creatively some of the time. I think that creative work is where many kids develop their voices as writers–when he’s older, he should be able to transfer what he’s learned from creative writing to more formal work. How great that he writes “monster/planet games” and “comic stories”–even if there is little text. Think about it–he’s valuing telling stories on paper. He’s doing it for fun! It can be hard to get kids to that place, so you have a great start. If he continues to enjoy those activities, it’s likely that the text will increase eventually. I wouldn’t worry too much about your daughter not finishing stories. Does she care about finishing them, or does it just bother you that she doesn’t? She’s young; it’s probably somewhat developmental. Then again, she might just be someone who gets excited about new ideas. My 14-year-old daughter is still like that somewhat. I’m sure your daughter will find things she likes enough to stick with as she gets older. But in the meanwhile, I think it’s a good idea to encourage whatever excites her, even if it’s something different each time. You might want to think about suggesting your kids make gifts of their stories for someone, if they start something they’re excited about. There would be a real reason to finish their pieces, and work a bit at them. And you could offer to help if they wanted it. Just a thought. And when your little guy “loves to chat” you might try writing down what he says. It doesn’t need to be a story. Can’t hurt to try to get him excited about seeing his thoughts on paper while he’s still little. Also, when your kids get older and have papers to work on at home, you’ll be able to help them structure their work. My oldest went to school last year at 16. When he first started writing papers, I helped him brainstorm. He’d pace around, thinking of ideas, and I’d write them on Post-Its. Then we’d work together to structure them into an informal outline. He does it himself now, although he often likes to run ideas by me before he starts a paper. He also realizes that he needs to give himself time to organize his ideas–he never starts his papers at the last minute. I’m so glad he learned the importance of that. Thanks for thoughtful response to my questions! My other problem is that I really don’t know what is developmentally expected of them. Of course all kids are different and my 3 are all pretty unique 😉 but there are things a 7/8 yo is somehow expected to be able to do writing-wise… or not? But look at the project you’re doing with your kids! It’s creative writing, and they want to do it with you! You have such natural instincts for what they need–I’d keep going with that comic. It might seem tedious at times, and it might seem more fun that academic, but the fact that you’re taking time to have fun on paper with them is a real gift. That’s how you develop a love for writing in kids–and that’s the most important writing skill you can give them. How can I refuse responding to such a cutie-patooty photo of you Tricia? My main concern is whether our next two kids will find their “voice” in their own writing (our first did!) and that is my hope for them as well. I believe that all the other stuff (spelling, structure, etc.) will fall into place with exposure and practice; but having a “voice” is indicative of true writing ability. You got it, sister! You have the priorities right; I’m sure the other two will do just fine. Mr. C is already well on his way. And young O is an awesome writer. My kids are too young for me to have any fears yet. Maybe if they aren’t comfortable writing a few years down the road I’ll have a different story to tell, but at the moment … no worries. My hope for them is that they will feel comfortable expressing themselves in words in some way, shape, or form — and there are soooo many forms (from novels, to essays, to poetry, to a concise and pertinent memo…). But, thinking back as I look ahead … Maybe some helpful hints for figuring out what types of writers kids are and the best way to help them achieve their goals? My mother was a high school English teacher (she has since escaped the classroom). It used to drive her absolutely mad that, as a student, I could whip out a term paper in one night and get an A — but I got zeros on all my interim homework assignments because I could not abide the foundation steps of outline, abstract, etc. I’d have to go back and do them after the fact. Just not how my mind works. I don’t want to impart bad habits on kids whose brains may work differently than my own, but also don’t want to have the same sort of battles that my Mom and I used to have over the “right way” to approach various styles of writing. Angela, I love what you say about there not being a “right way” to approach writing. So many of my ideas for this book come not from my teaching background, but my experiences learning to write as an adult. I love talking to other writers about their approaches, and reading books in which professional writers share their approaches, and everyone is so different! The key, as you say, is finding what works well for you, and this is a big idea that I’m hoping to explore: how do you figure out what works for your kid? I’ve rambled on quite a bit about it, so you probably already know that I think taking dictation from young kids is incredibly valuable in their formation as writers. I’d see if there’s anything they’d like to talk about that’s worth saving on paper (Pokemon, anyone?) and I’d write it down for them. If you do this on a somewhat regular basis, you might be surprised at how much they can learn from it. Lots of “mechanics” come up in the course of writing down what they want to say. Why I think this is valuable for young kids: it helps them develop a voice as a writer, while they’re still young and expressive, years before they can easily do so themselves on paper. It helps them see the value of putting their words on a page (to keep for themselves, to illustrate, to make a book, to share with others…) And if you help them develop a love of preserving their thoughts in writing, they’ll be motivated to do the same for themselves when they’re ready. Yes, Patricia, Thanks to your suggestion I have switched from dictation on the computer to dictation by hand. And might I say that my hand is not so thankful (-; I took 13 — count them, THIRTEEN — handwritten, legal pad pages of a fairy princess story from my 5YO. And yes, she was bouncing on the bed pretty much the whole time. My hand cramped up quite a bit, but it was truly fascinating! *Thirteen* hand-written pages? I feel like I ought to have some sort of award for you! I’m glad to hear that you found it fascinating, at least. I sometimes take dictation on the computer, depending on the project. But hand-written is great, if you want to inspire kids to write by hand. It’s just more tangible for them, I think. Plus, it helps us remember how tedious writing can be, and makes us more sympathetic to the kids’ efforts. Keep writing, mama! I’ll bet your daughter gets a lot out of it. Please let me know how it goes. greetings…..I do have concerns when it comes to write. First, I really want my children to know their language and to have a command of that. We write so much here and play funny games just to see how many different sorts of words my sweet children can use. Grammar is another issue however. When is it the right time to correct grammar and when is it a discouraging time to correct grammar. Another point is that I really want them to write from their heart and to have the confidence to do this. I’m always worried that if I over correct them then they will lose their passion to write because they feel criticized. Each genre of writing is an experience unto itself. We have had so much fun creating many moments within writing genres. My biggest worry is that somehow I will discourage them. Luckily this hasn’t happened yet but I reallyworry about this. There is nothing better than watching an inspired child writing and creating something which expresses their thoughts on the matter. Nice to hear from you again, Valarie! You’ve brought up such a great topic, and I feel a ramble coming on. Please excuse me in advance! I’ve come to believe that kids can learn an awful lot from positive feedback on their writing. Not general “you’re so great” kind of feedback, but very specific feedback such as “the character’s dialogue is really convincing here” or “the beginning of your essay makes me want to keep reading.” I think kids need to know what they’re doing well so they can keep doing it. I’ve seen how much positive feedback helps in my writing workshops with kids, as well as in my writing groups with fellow adult writers. In his book Writing with Power, Peter Elbow also writes about this. As an experiment, he only gave positive feedback to a group of students, and was pleasantly surprised at how much their writing progressed. One thing that’s worked well with my older two, once they were 12 or so, is to give them the sort of written feedback the adults in my writing group give each other. They double-space their work and print it out, and I respond in writing. Just like in my group, I make sure to give lots of positive feedback, underlining things I like, with a little explanation of why. Then I also write questions I have in the margins, or underline parts that aren’t clear, or places where I’d like to know more. I make sure to keep a high positive to constructive ratio, especially with the kids. There’s something about getting the feedback in writing that my kids like–and they ask for feedback quite often! I think they see me as a colleague, someone who can help–rather than a mom who just wants to correct their work. Valarie, I don’t think you’ll discourage your kids, because it seems so important to you that you don’t. I can tell that their creativity matters to you. So long as you keep that as your guiding force, I’m sure you’ll be fine. Oooh, I learned that I can only give constructive criticism when the kids are ready for it or my boys seem to hear “I’m always wrong.” When my boys wanted the help, it was because the writing was for a wider audience, not only for themselves. The asking had to come from them if the learning was to be meaningful. Hey, maybe you could write some things about this! That would be truly helpful to me! I am late in replying, but wanted to add my input. My hope is that my children will enjoy writing and not find it a chore or be intimidated by it. I hope they see that writing provides an opportunity to articulate and refine their thoughts and ideas in a creative and enlightening way. Above all, I hope they enjoy the creative process as much as they do painting or mudpie-making (or lego-building, ahem). And…I hope I have the wisdom to provide guidance when they need/ask for it and to back off when they don’t! Those sound like perfectly reasonable hopes to me. You can do it! I’ve been pondering your questions and started a response twice only to be thwarted by it being the end of the day and someone (helpfully) turning off my computer before they go to bed — ha, I was already in bed myself! oops. Anyhow, I have four boys, 3, 5, 13, and 15 and have always homeschooled them. My oldest boy has ALWAYS been one that will NOT do anything just for the sake of doing it — he must have a reason and a desire as well. (One of the main reasons we felt homeschooling was the best option for our family.) If I MAKDE (or MAKE) him do something just because I say so, the resulting work or whatever can be just done but then forgotten about forever. So, from the start I have had to think about the why’s behind everything I ask him to do and what the outcome might be. He is driven in areas and I’ve had to use those areas to help him learn the concepts we’ve wanted him to learn. So, as for learning — we have used his interests from the beginning. Trains – let’s learn about trains, examine train schedules, read stories about trains, let’s write about real trains, make up stories with trains, let’s take pictures of trains, take videos of them, ride them, count them, classify them. I think you get the picture. Son number two – let’s use Legos. Same deal. They are 15 and 13 and we are still using these interests to learn the higher concepts where possible. Son number one has two websites about trains, where he writes, blogs, includes photos and videos of trains for like minded folks. Son number two has a couple websites too where he writes about Legos and another interest he developed over time (computer graphics – first learned in relation to his interest in Legos.). We’ll see where sons 3 and 4 go. My five year old draws a lot about animals and he writes letters and cards to people on his own. So – writing concerns. Had them before I truly embraced what my kids were into and let them lead me. I have read and reread the books Any Child Can Write by Harvey Wiener, Boy Writers by Ralph Fletcher, and Write for Insight by William Strong. Love all those books as well as your website and Camp Creek Blog among others who have come and gone. Hey, I could write more – or you can email me with questions but I want to get this off before it disappears. And I have to make some buildings with my little ones with shoe boxes before they lose their new interest in this project! Good luck on your chapter this month! So glad you finally got to send your response, Cathy. And glad that I *finally* got to answer it! My oldest sure sounds a lot like your oldest. He taught me the importance of child-led learning, whether I wanted to learn or not. (I’m glad he did!) We like to joke that his motto should be “What’s the point of that?” His learning has always had to be something he cares about. That’s so great that your older two have blogs and websites! Those are just the sort of activities I mean when I mention authentic writing experiences. Very self-motivating. Thanks for the book recommendations. Fletcher’s Boy Writers is fantastic. I haven’t read the other two, but have now put them on hold at my library. As I work through this book, it will be helpful to get feedback from experienced folks like you, so I will definitely keep your contact info. Thanks so much for taking the time to share your experiences. Oh boy, for you, anything. Nice sweater. . . I hope my kids write better than my students. I hope one of them finds extreme joy in writing, at least. I’d be happy if they were all competent to use writing for whatever they need or want. That said, I wouldn’t kick a published writer out of the family! Well, based on the, um, memorable lines you’ve shared from your students, you should have no worries about that first hope. And I’ve seen one of your kids take joy in her writing, so you’ve got that one down too. Well, I’m hopelessly behind the times here, having guests and then moving into a house the last week or two. I’m still moving in, but I just noticed your “thanks” post in my RSS feed. I assume it’s too late, but just in case, I will chime in anyway. With my kids, I’ve been lucky enough to find you and your blog to guide me through what I assume is the early stages of writing development; my daughter tells herself stories all day long as she plays, and on one occasion I took dictation and she loved it. I know I need to do this more, but I’m not worried about her development, basically because I’ve had your guidance and know what I can do (take dictation), and because I hear her sentence construction evolving as she grows, from things like “she said,” to “she stated”. I can only hope it evolves back to “said” as she gets older, because “stated” is a bit too fussy for me. I noticed that when we read the first Septimus Heap book, Magyk, Angie Sage continually uses “remonstrated” as a way to attribute dialog, and it drove me crazy!). As far as my own writing goes, I’ve worried about that a lot more over the years. It’ll be uninteresting, irrelevant, inconsistent, out of character, or incomprehensible . . . I could go on ad nauseum, but I won’t, as I’m sure you get the idea and have already finished your chapter anyway. Finally, I hope my kids will want to write and that it won’t feel like a chore to them, and that they won’t get bogged down in the hopeless procrastination that always seems to plague me (due, I suspect, to all the worries listed above). Thanks for writing about this! I loved hearing how A says “she stated”, even though it’s fussy. It shows that she’s playing with language, which is so fantastic. Another great example of how kids can grow as writers, even if they aren’t technically writing yet! I think you’re being too hard on your own writing! I always enjoy reading your literate, thoughtful comments here. Maybe you need to find some fun outlets for your own writing–I’m planning a chapter on that too! Congratulations on finally being back in a home. That must be a relief!